EIA’s recently released Annual Energy Outlook 2019 projects that the U.S. electric power sector emissions of sulfur dioxide (SO2), nitrogen oxides (NOx), and carbon dioxide (CO2) will remain mostly flat through 2050, assuming no changes to current laws and regulations. SO2 and NOx emissions from the U.S. electric power sector have declined over the past several decades, largely because of the phased implementation of regulations under the Clean Air Act Amendments of 1990. For SO2, these regulations include acid rain cap-and-trade program deadlines in 1995 and 2000. One of the main regulations affecting NOx emissions was the 2003 expansion of the Environmental Protection Agency’s (EPA) NOx Budget Trading Program (Title I) to include most states east of the Mississippi River. In addition, the EPA’s Mercury and Air Toxics Standards (MATS), announced in 2011 and implemented in 2015, required power generators to comply with emissions limits for toxic air pollutants associated with fuel combustion such as mercury, arsenic, and heavy metals. Although MATS targets mercury and air toxics emissions, power plants’ compliance with the rule also decreased emissions of SO2 and NOx. Similarly, none of these programs targeted CO2 emissions explicitly, but they did indirectly affect the economics of power plant fuel use and operation rates as well as plant investment and retirement decisions. CO2 emissions in the U.S. electric power sector have been generally declining since their 2007 peak of 2.4 billion metric tons (mt). 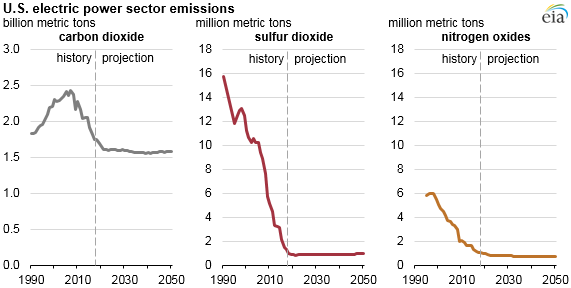 EIA projects that electric power sector CO2 emissions will remain relatively unchanged throughout the AEO projection period, decreasing just 0.1 billion metric tons from 2018 through 2050. By 2050, U.S. electric power sector emissions will be about 1.6 billion metric tons, or nearly equal to what they were in 1984. Power sector emissions are expected to remain relatively flat despite EIA's projected 23% increase in electricity generation from 2018 to 2050. In the Reference case projection, added electricity generation will mostly come from natural gas and renewables, which emit less or no carbon dioxide as part of their electricity generation. More than one-third (37%) of the coal-fired capacity in place in 2018 will retire by the end of the projection period, largely because of decreased competitiveness with relatively low cost natural gas combined-cycle generators that operate at high efficiencies. Also, renewables that are currently benefiting from production and investment tax credits and state renewable portfolio standards have seen cost reductions in recent years that make them more competitive in the future. The largest source of new generation capacity in the projection is from renewable energy, principally solar photovoltaic, and in the near term, wind. Combined renewables generation capacity across all sectors will increase by almost 400 gigawatts (GW) by 2050. The next largest source of added generation capacity will be from natural gas—about 360 GW. These additions of low- and non-carbon generation capacity will allow generation to increase while holding CO2 emissions mostly flat. The carbon intensity of the electric power sector, expressed in tons of CO2 per megawatthour produced, will decline by 26% from 2018 to 2050, or slightly less than 1% per year.